I recently came across and started reading a webcomic called Bunny. It’s a pretty random comic that sometimes makes sense and is funny, and other times doesn’t make any sense at all (yet somehow still manages to be funny). 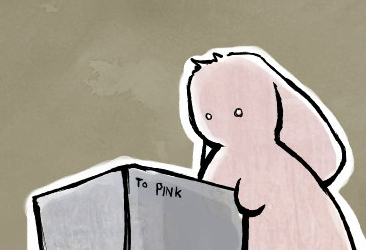 Like xkcd and Wondermark, Bunny has secret messages in the alt text. Another webcomic I enjoy and don’t think I’ve ever written about is Lackadaisy. This is one of the most beautifully drawn webcomics I’ve ever seen, and on top of that, the story is wonderfully compelling. Oh, and the characters are all cats. The major downside to Lackadaisy is that, because each “page” of the comic is so lush, the story progresses very slowly. Finally, I just wanted to say that I can’t stop watching the Nanerpuss commercial for Denny’s Grand Slam.